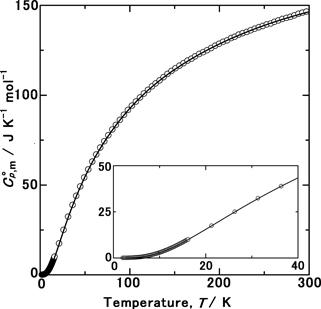 The isobaric heat capacities, C°p,m, for Ag2MoO4 at 2-300 K were measured by the relaxation method. Ag2MoO4 is harmful phase formed in nuclear fuel waste glasses. The third law entropy, S°m, determined via the Debye-Einstein function was: S°m(Ag2MoO4(cr), 298.15 K)/J K-1 mol-1 = 219.87 ± 2.20. The phase stability of Ag2MoO4 was discussed on the basis of its standard Gibbs energy of formation, ΔfG°m, which was derived by combining S°m determined in this study with the reference datum of the standard enthalpy of formation, ΔfH°m. Ag2MoO4 was found to exhibit greater phase stability in nuclear fuel waste glasses than transition metal molybdates such as NiMoO4 and ZrMo2O8.